This offer ends 30 November 2018 and is valid for COD orders only. This may not be used in conjunction with any other special or consignment. Terms and Conditions apply. Please contact your representative for more details. Click here for clinical cases. Conical Connection: The C1 benefits from a conical connection with an anti-rotation, six position index. The absolute implant-abutment fastening and the definite seal offered by the conical connection minimize micro-movements and preserve the bone and soft tissue. Platform Switching: The C1 System incorporates platform switching by design, allowing the ideal environment for soft-tissue growth and minimizing bone resorption. The platforms are color coded to match the prosthetic components for a simplified restoration. Dual Stability Mechanism: The C1’s unique DSM concept combines mechanical and biological stability in an effort to make a more predictable bone response. The upper two-thirds of the implant’s body compresses the bone to keep the implant stable, while in the lower third only the threads contact the bone. This forms small compartments between the implant body and the bone, allowing for new bone to regrow and osseointegrate. Micro Rings: Micro rings (0.1 x 0.3) on the implant’s neck improve the BIC (Bone to Implant Contact) and reduce overcompression at the crestal zone. Surface: The surface roughness and micro-morphology combine sand blasting and acid etching. MIS’ notable surface technology has provided millions of patients and clinicians with excellent osseointegration results and long lasting clinical success. View the C1 Procedure Video here. Millions of people around the world have gotten their smile back, with SEVEN. 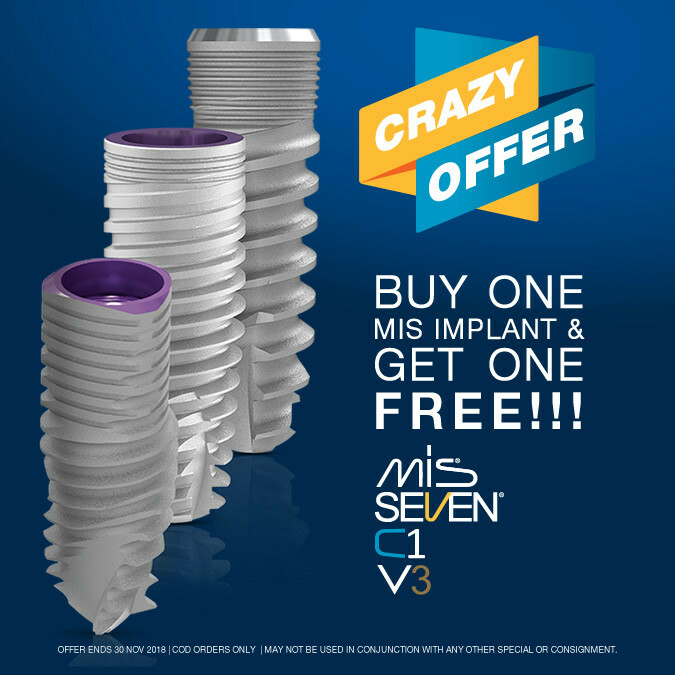 The SEVEN implant has been our longstanding best seller for over a decade! Proven success meets enhanced stability.